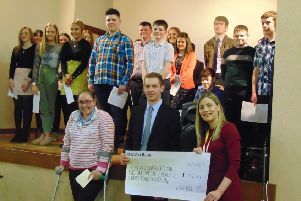 Rathfriland YFC have had a busy September, with the start of the new club year. Two meetings in, the club are excited for the year ahead welcoming both new and old faces back to fortnightly meetings. On Saturday, September 8th, Rathfriland YFC held their first big breakfast and information morning in their club hall, Downpatrick Street, Rathfriland. The event was kindly sponsored by Milestone, Rathfriland, Home Bakery Rathfriland, Mourne Eggs O’Hares, Rathfriland and could not have been held without the help of Audrey McDowell and team running the kitchen and Regal Fabrications for the loan of the cooking equipment. The informal morning gave the opportunity for both potential members as well as their family/friends to come along and find out what the Young Farmers’ Clubs of Ulster is all about as well as find out information on joining Rathfriland. The club would like to thank the local community for their support. On Monday, September 10th, the club started their program with the annual new members night. The club were delighted to welcome so many new faces as well as the usual returning members. The evening consisted of ice breaker games such as shave the balloon, fluffy bunnies and pass the polo. This was followed by a well deserved supper. On Monday, September 24th, the club held their second meeting of the year with guest speaker Joe Graham past YFCU president from Trillick taking the meeting. Joe told members of the importance of taking part in the club program and competitions and how by doing so, he has acquired skills that would otherwise have been difficult to achieve. This includes public speaking, something a lot of us find hard. The evening concluded with a hearty supper. For anyone who is still interested in joining Rathfriland YFC there is still time to do so, just follow us on Facebook to keep up to date with all the latest meetings and tag along. The club look forward to their upcoming fashion show on Friday, October 19th including style from Martha Janes, Rathfriland, SM Shoes, Rathfriland and Amelia Jane, Kilkeel. Tickets can be purchased by phoning 07938 877089. Rathfriland YFC look forward to seeing you there. Following dates for your diary: November 9th – Junior disco.